The last known population of woolly mammoths did not "inevitably" die out because of inbreeding and lack of genetic diversity, a study suggests. Scientists used techniques normally used to tackle crime scenes to carry out DNA analysis of samples taken from Wrangel Island in the Arctic Ocean. They said that it was more likely that human activity or environmental factors killed off the healthy creatures. Their work is published in the journal Molecular Ecology. Although mammoths generally died out and disappeared from mainland Eurasia and North America around 10,000 years ago, about 500-1,000 mammoths continued to survive on Wrangel Island for a further 6,000 years. The 7,000 sq km Wrangel is about 140km from the Russian mainland. Scientists working together in the UK and Sweden also say their research could have immense implications for modern-day conservation programmes. They examined bones, teeth and tusks from the island and compared these with samples found in Chukotka in north-east Siberia. Report co-author Dr Love Dalen from the department of molecular systematics at the Swedish Museum of Natural History told the BBC the team had been working on the study since 2008. He said: "We wanted to find out why these mammoths became extinct. "Wrangel Island is not that big and it was initially thought that such a small population could have suffered problems of inbreeding and a lack of genetic diversity." He said many previous studies of mammoth DNA had focused on using mitochondrial DNA - genetic information which is passed down on the maternal line. As cells contain multiple copies of the mitochondrial genome, this DNA is easier to extract from ancient remains than the DNA found in the nucleus of cells. "But the problem is mammoths don't display that much genetic variation - especially towards the end of their line," Dr Dalen explained. "We decided to focus on microsatellites (repeated sequences in the DNA) to compare genetic fingerprints of each individual mammoth. This gave us access to nuclear DNA and gave us far stronger results." He said that during the ice age, the total mammoth population in Eurasia dipped from tens of thousands to very few. Dr Dalen added: "The DNA investigations found there was a 30% loss in genetic diversity as the population levels dropped - but that was to be expected. "But when we examined the samples from the island, there reached a point when this reached a plateau and there was no more loss. This stage continued until the creatures became extinct. "This therefore rejects the inbreeding theory. The mammoths on the island were isolated for nearly 6,000 years but yet managed to maintain a stable population." The report concluded that the island was large enough for the creatures and so the final extinction was "not a delayed outcome of an inevitable process" such as inbreeding. "This suggests that the final extinction was caused by a rapid change in the mammoths' environment, such as the arrival of humans or a change in climate, rather than a gradual decline in population size," the study concludes. 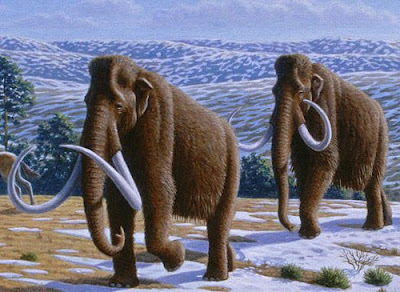 Dr Dalen said further investigation focusing on finding the last few woolly mammoths was needed but added: "If humans hunted them to extinction, I would expect us to find evidence of that. I'm personally leaning towards environmental change." The researchers - who studied 76 samples altogether - also used a computational approach to investigate the population size on the island and how the genetic make-up of the creatures had changed over the years. The team found that there was a sharp decease in the numbers of mammoths in north-east Siberia during the Pleistocene/Holocene transition (about 12,000 years ago). But the group concluded this was likely to be because the Wrangel Island mammoths became increasingly isolated as the sea levels rose around them. Dr Dalen said: "We took a statistical approach to the genetics and data. We found that there were at least 500-1,000 mammoths at any one time living on the island before they died out. He said this had immense implications for current research. "What's really interesting is that maintaining 500 effective individuals is a very common target in conservation programmes. "Our results therefore support the idea that such an effective population size is enough to maintain genetic diversity for thousands of years. "These mammoths did fine with what was originally considered to be a small number," he said. The scientists' work has been reviewed by evolutionary geneticist and University College London Professor Mark Thomas. He said they had produced a significant moment in mammoth research. "They have carried out the detailed research in the way it needs to be done but hadn't yet been done before. "They examined the DNA of multiple samples and they showed that by having a constant size population, the Wrangel Island mammoths were not just doomed to die.